Trash that washes ashore has been turned into art. 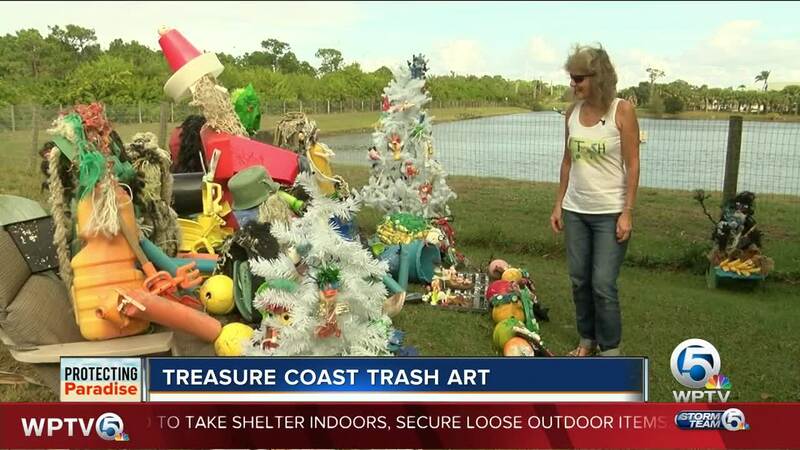 MARTIN COUNTY, Fla. — Not once or twice, but at least three times week, you’ll find Cristina Maldonado and Rebecca Fatzinger picking up trash along the shoreline. "Walk along the seaweed and look," said Maldonado. "Anywhere from Normandy up to Walton Rocks," said Maldonado. "And I go from Bathtub to Jensen," said Fatzinger. Whatever they find is useful for when the real fun begins. "Surprise every time," said Maldonado. Rebecca has about 20 containers full of trash at her home. All of it is used for their colorful creations. Her backyard is like an art show. On this day she focused on the holidays. "That’s the grinch," Fatzinger said. "Santa, I made him this past week." Then there was a special Beatles creation. "This is the Beatles, trashy road," said Fatzinger. For the past several years, Rebecca and Cristina have been constructing many different creatures. "Probably say a thousand," said Maldonado. They call it TC Trash Art. "A lot of fun," said Fatzinger. "Help pick up some things and save a bird or washing out to sea." As for what they hope to do with their art, that’s up in the air. "Make some kind of children book, use the characters that we’ve made into some kind of story that would help limit plastic use and clean up the planet," Maldonado said. Both know they won’t stop having fun while protecting paradise as long as trash keeps washing ashore. "Doing this makes it really fun," said Maldonado. "Definitely is an addiction."